I read somewhere that installing PyQtForSoftimage could be difficult, so I gave it a try. I didn’t have any problems. For my test, I installed PyQtForSoftimage in Softimage 2014 SP2, using Python 2.7.3 and pywin32 218. Here’s a recipe that will work with Softimage 2014 and earlier. But if you’re using Softimage 2014, you can skip the part about using the system Python. Instead, use PYTHONPATH to point to folder where PyQt4 is installed (hat tip: Tim C). You need to switch from the Python installed with Softimage to the system Python (and pywin32), install PyQT, and then install the PyQtForSoftimage addon. Download and install Python 2.7.x (Note that Softimage ships with Python v2.7.3). Download and install pywin32 (Softimage ships with pywin32 217). 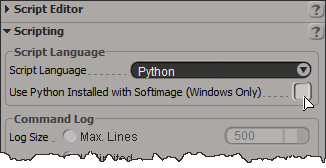 In the Softimage Scripting preferences, clear the Use Python Installed with Softimage check box. Then restart Softimage. Download (right-click and then click Save As) and install the PyQtForSoftimage addon. Check that everything is working. Open the Plug-in Manager, find PyQtForSoftimage, and run some of the examples. I found that the ExampleDialog and ExampleSignalSlot examples did pop up dialogs, but the Log Text button didn’t log anything to the history log. 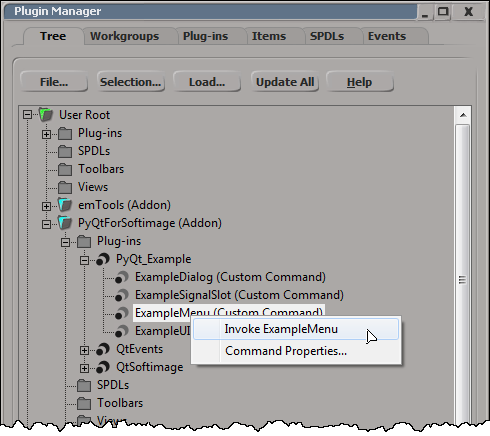 Set the PYTHONPATH environment variable to point to the location of PyQt4. You could do this in setenv.bat, or in the System environment variables. 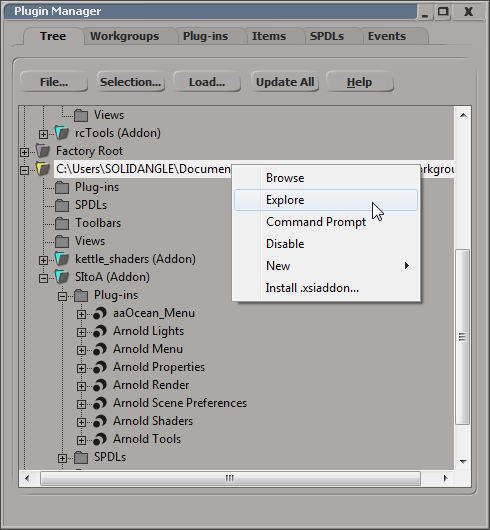 From the Plug-in Tree, you can quickly open up Windows Explorer (or a Command Prompt) on the location of a workgroup, plugin, or addon. Just right-click a folder in the Plug-in Tree and click Explore (for Windows Explorer) or Command Prompt. Or click Browse to open a Softimage browser. So you installed a plugin, but now you cannot find out how to access the plugin in Softimage. If the plugin added a menu command, and it’s a scripted plugin, we can find it by checking the plugin code (in the Plugin Manager > Tree, right-click the plugin and click Edit). Find the definition of XSILoadPlugin. In the XSILoadPlugin function, look for any calls to RegisterMenu. RegisterMenu uses what’s called a “menu anchor” to define a new menu command. In this example, the menu anchor is siMenuMainFileExportID. In this video, I show how to package a collection of ICE compounds as an addon (.xsiaddon). The compounds I use are by Piotrekm.